This Post is not for the feint hearted! We are all suffering with Cheryl's ailments of late. I am determined to 'fix' the problems once and for all. Althought it is good for blogging, I doubt I will run out of ideas and will find many worthwhile things to write about. Of course I am always open to suggestions, keep them rolling in.. When I visited the doctor on Wednesday morning I was not aware that I had redness and swelling above the knee at the back of the leg. Yes! It is the same left leg. I decided against going to Wingham with 'The King' who was scheduled to visit the accountant. I thought a restful day was in order with a light exercise thrown in. I happily allowed 'The King' to take the car rather than the Hilux utility. In his absence I sorted through the books on the study floor and came out with my copy of 'YOUR OWN PERFECT MEDICINE' by Martha M Christy. 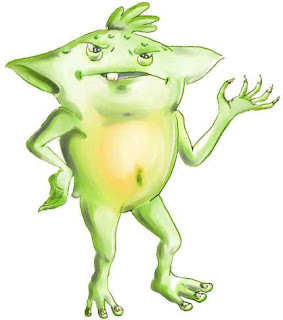 If you are not familiar with urine therapy now is the time to stop reading. I felt that I had nothing to lose by using my own urine to massage the leg. I have been using Voltarin Gel and Hirudoid ointment which does not appear to be doing much at all. I also take Horsechestnut night and morning. I have not lost sight that Juliet George stated at the Lymphoedema Support Group meeting Tuesday that more people die from thrombosis than cancer. He said it indicated problems with the clotting factor. Paul, being a bio-chemist, always looks at the underlying body chemistry. We will, in time, be looking to find the cause. In the meantime I am to treat the symptoms. Tonight I am to eat late. After dinner I am to take 10 grams of Vitamin C (calcium ascorbate) powder and go to bed in an effort to hold the Vitamin C for the longest possible time. I gave thanks to Jezz, my personal angel, as I took the Vitamin C powder from drawer. It was one of the many health supplements I had sent to him while he was living in Victoria. It had never been opened. In January 2007 I had the unenviable task of sorting through his personal things. The lease was due to expire on the house. Whatever made me bring it home with me? So..tonight my gratitude goes to Paul, for the suggestion, and Jezz for providing the Vitamin C powder that will, hopefully, bring me through this latest crisis. Why the caption? I believe that the problem has come about through the number of hours spent sitting on the hard dining room chairs. 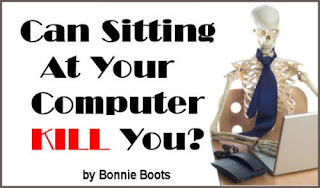 Given that the nerve pain in the arm is debilitating and the second thrombosis has the potential to be life threatening I will certainly make other arrangement for using the laptop. I will not be giving up Blogging, Facebook and e-mails to my special friends. I know how much your friendship has changed my life. This has been an amazing week and I am so glad of the opportunity to share with you some of the highlights. Wednesday morning I arrived at my regular medical practice to see a doctor that I had not seen previously. You may be aware that my doctor has been absent for some time. Dr Mark Henderson welcomed me warmly. It was his second day at the practice. I briefly described my current situation explaining that I did not necessarily like taking prescription drugs, particularly morphine, which is absolutely essential at this time. Remembering that I have also been seeing Dr F in Sydney, I do not have complete medical records at the Adamstown practice. Dr Henderson did not seem to think it was an unusual request. 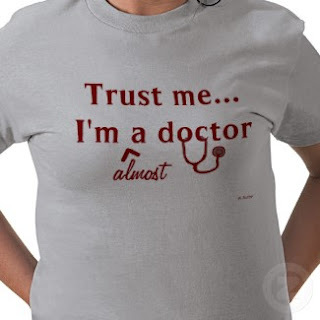 I felt immediately that our doctor/patient relationship would be based on trust. I gave him the run down on the testing, knowing that the outcome confirmed that there was no evidence of skeletal metastases, but it still does not give us an explanation for the pain which requires desperate measure to control. Dr Henderson asked if I had experienced any sweats. I explained that I thought the ones I had were related to the heat but wondered why he asked. He thought it could have been a low grade infection. He then did the extraordinary and asked what I thought about iridology. Wow! I was impressed! Explained that I was a patient of Nancy Evelyn and it turned out that he is also. Done! Happy to make an appointment with Nancy to check out the possibility of infection using iridology as the diagnostic tool. Before leaving I asked about seeing him at a later date knowing how hard it is to get an appointment these days. He advised me to tell the girls at reception that I was to have an appointment any time I phoned irrespective of how busy he was. The real surprise came when I went to pay the bill only to be told that the good doctor said I was to be bulk billed. For those not familiar with the terms Medicare is Australia’s universal health care system. Medicare ensures that all Australians have access to free or low-cost medical, optometrical and hospital care while being free to choose private health services and in special circumstances allied health services. I am frustrated that I have been unable to purchase good second hand book shelves since moving to the farm. It probably has something to do with the fact that book lovers like to keep their books and, of course, their bookshelves. Yesterday while looking through the pile of books sitting on the floor I was drawn to my copy of 'The Seat of the Soul by Gary Zukav.' I have not read the book yet I found it interesting that I opened it to a chapter on Psychology. It states that Psychology means soul knowledge or the study of the spirit. Given that I am still taking Oxycontin twice per day for the intense pain that has been my constant companion for months I read on through the few pages. I remembered recently that David, my local hypnotherapist had mentioned that we are emotional, physical and spiritual beings and for complete healing it might be wise to address the pain on these levels. I understand from the book that the experience of pain, coupled with an understanding that pain, serves a worthy purpose. As I read that suffering in meaningful I questioned the purpose. I wondered if there could be any truth in the statement that suffering can be endured because it is necessary for the evolution of our soul? 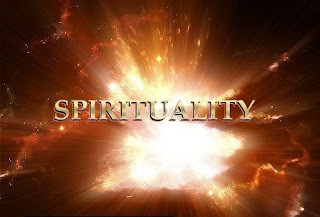 I believe that we are spirits having a human experience. I do not see death as 'the end.' Surely there must be some other way to learn the lessons. I do not believe it has to be this painful! The lessons came hard and fast as I read that if you are unkind to yourself you will, in turn, be unkind to others. By neglecting myself could I possibly be treating others in the same manner? Was I truly able to feel compassion for myself and compassion for others? I quote the following in the knowledge that, for me, it is of utmost importance. There was a time recently that I became aware that I had put myself in my current situation. As I was walking down the drive at the farm, literally screaming in pain, I said to myself 'You have done this to yourself.' It was a light globe moment for me. I was so sure that I had always shown unconditional love for Jeremy. His passing leaft me in a state of utter disbelief and grief. Although he remained with me in essence, I no longer had the joy of physical contact. I began to think about the love that I had felt and expressed so readily and easily. There was never a conversation that did not end 'Love you Sunshine.' He shared with me that he always felt that I loved him unconditionally. Of course, I began to look at the way I had abused my body over the two years since his passing. Drinking far too much coffee and not eating correctly has taken its toll. Given that I have lived with cancer since 1996 I knew, with absolute certainty, that in order to love others in the way I proclaimed to, then I had first to apply the principal to myself. It is with a clear vision that I choose healthy food knowing that food is to be my medicine. For those that have been following my blogs I would like to continue with both for the time being. I feel that this Indigo Dreaming will be related to Health and Spirituality. The two things that are very important to me, and I feel are interrelated. Many of the decisions that I make these days come after much 'soul' searching. I feel that it has enabled me to make good choices. I listen carefully to medical advice, no longer allowing myself to be afraid. I was diagnosed with a melanoma. It was removed in 1996 just prior to my marriage to Haydn. I will always be grateful to Hamish Foster, who removed the tumour in its entirety, rather than doing a biopsy. At that time he said that he does not like to biopsy anything that could be a melanoma. Safer to remove it completely! Today I realised that I still have two breast lumps that are painful, and causing me problems. Both the CT and Bone Scan Reports state that there is no evidence of metastases. That 'sort of' gives me the all clear. This being the case why am I still taking 1 x 20mg Oxycontin Slow Release tablet twice each day? This brings me to the decision to try The Castor Oil Pack. Take two cotton cloths (each about half the size of a tea towel) and a piece of plastic (a plastic shopping bag will do nicely.) Wet one cotton cloth and squeeze dry placing flat on the plastic. Place the dry cotton cloth over this and liberally spread with castor oil. Fill a hot water bottle with hot water and place the pack (castor oil side down) over the area. Wrap a towel around to hold in place and put the hot water bottle over it. The heat will open the pores and allow the oil to be absorbed. Keep the pack on for about 1 hour and repeat each day for three days. I intend to roll the pack up and re-use the next day adding more castor oil as necessary. On the fourth day massage the area with olive oil and do this for the next two days. On the seventh day, do nothing. This entire procedure will be repeated for a period of seven weeks. I believe I have everything to gain and nothing to lose. Although it was my intention to begin tonight, I have decided that it is probably best to do it during the day. I really think that it has the potential to be quite messy. There are a couple of other things that appear to be making a difference; I look forward to sharing with you. For some time I had been concerned about the fungus in my nails. I had stopped having my regular pedicures and was painting on a 3% Hydrogen Peroxide solution night and morning. At the back of my mind there was an awareness that the tumour removed at the time of my mastectomy was fungating. Not sure that there is any relationship, but I was not prepared to take unnecessary risks at this time. Tuesday I ask Dr F in Sydney for an opinion. He presented me with a hypodermic syringe and asked if I had any Tea Tea Oil. Does not every Australian home have a bottle handy? 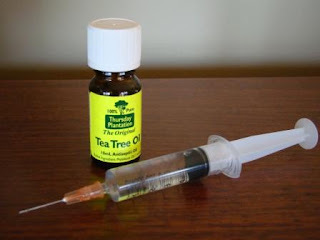 I have now filled the syringe with pure Tea Tree Oil and, placing the needle carefully from the side under the nail, I ensure that the Tea Tree Oil saturates the nail bed. I am optimistic! It will take some months for the results to become obvious. Each day I give thanks for the special people that cross my path bringing with them their very personal gifts. A special Thank You to Liz Hayes, Mum to Angel Raymond for this verse written especially for me. I clasp them so close, they remind me of you. My baby, my son, so handsome, so strong. My memories are with me and I know they will last. When you where so far in front and I was starting to lag. Called me friend, my eyes opened and started to see. I melted a bit and knew 'its a start'. With they're memories, stories and support 'worth the share'. I can e-mail, light candles or maybe even phone. May hope sustain you, friends surround you and love give you strength in 2009.